You'll find some affiliate links within my blog posts, which means I get a small commission from anything you purchase that I recommend (at no additional cost to you). Thanks for helping to support my sewing hobby! 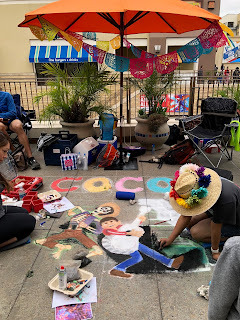 I love the start of summer - school is done, our daily pace slows down and we try to explore some of the local fun spots we don't get a chance to see during the school year. On top of all the normal awesome activities our area holds, special summer festivals abound! Outdoor concerts, food and wine gatherings, art shows - you name it and you can probably find it in Southern California during the summer months. I have a closet full of beautiful skirts and practical shorts for more chic or casual events respectively, but I don't have many easy dresses that pair well with my beloved converse. 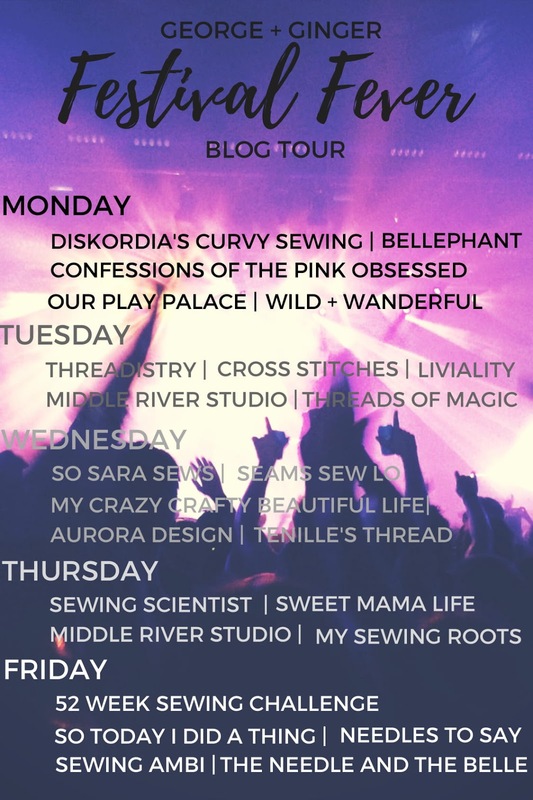 This was the summer I vowed to change that and I thought I'd start by trying to find the perfect t-shirt dress - just in time for the George + Ginger Festival Fever Blog Tour! I've pinned more inspiration pics than I can count of relaxed fit, short sleeve t-shirt dresses, but I didn't have much luck finding a pattern that was a good match. 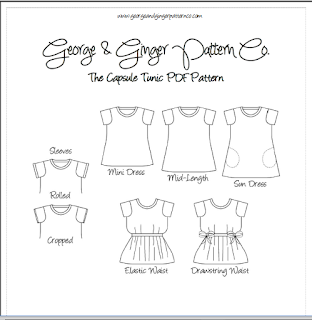 Earlier this year as George + Ginger was retiring the Capsule Collection, I snagged the Capsule Tunic pattern. 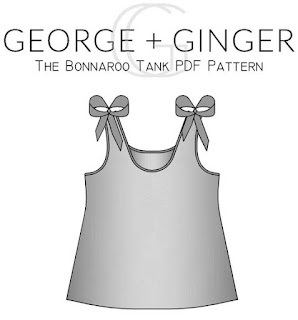 It had the shape I was looking for in a t-shirt dress, but it oddly didn't get much love in the G+G Facebook group. I had a feeling it was a hidden gem and I was totally correct! I chose the simplest of the pattern options as it matched my inspiration pics the best - mid length dress with cropped short sleeves. I traced off my normal size (4 bust, 8 hip) and added a bit of length to make sure it wasn't too short for me. After sewing it up, it was a bit *too* relaxed of a fit for my vision and I ultimately took 1" off each side seam all the way down. I also removed almost all of the length I added and did a 1" hem as suggested in the pattern. I used a lightweight, striped jersey fabric that is so soft and feels like a vintage tee that you've had for years. It was a great choice for this pattern. And now I have the perfect t-shirt dress that I've been looking for in stores for years! It's relaxed, but still shows that I have a shape under there. I love that I can pair it with converse, but it's also super cute with flats if I want to dress it up a bit. 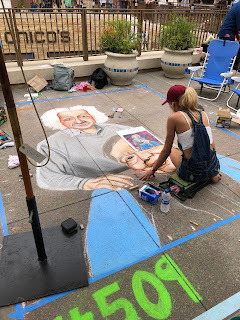 I was planning to wear it this past weekend to the Pasadena Chalk Festival, where artists descend onto one of our outdoor shopping areas and create chalk drawings on the walkways all weekend. It is a really cool event and something we look forward to walking through every year. But, in true So Cal June weather, it was too chilly for a short sleeve dress. No worries though, this one will get a ton of use this summer! 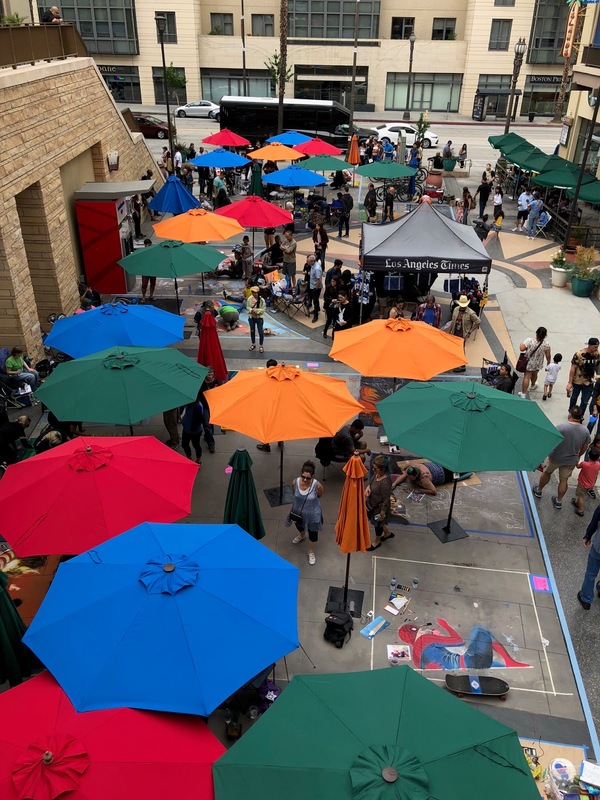 What events do you have on tap for this summer and are you planning to make anything for them? 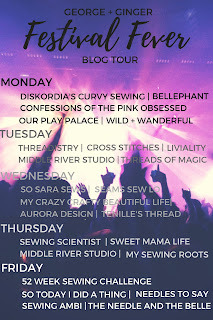 Let me know in the comments and be sure to check out all of the other amazing bloggers on the Festival Fever Blog Tour this week! While the weather can't seem to make up its mind here if it wants to be winter or spring, I am starting to focus on my summer wardrobe pieces. And if anything says summer fashion, it's a floaty maxi skirt and tank top! Kristi, the designer behind George + Ginger Pattern Co. is releasing a series of patterns for summer, which are all part of her Music Festival Collection. Think boho chic and perfect for music festivals (obviously), but also outdoor BBQs, days at the beach and generally soaking up the fun summer atmosphere. 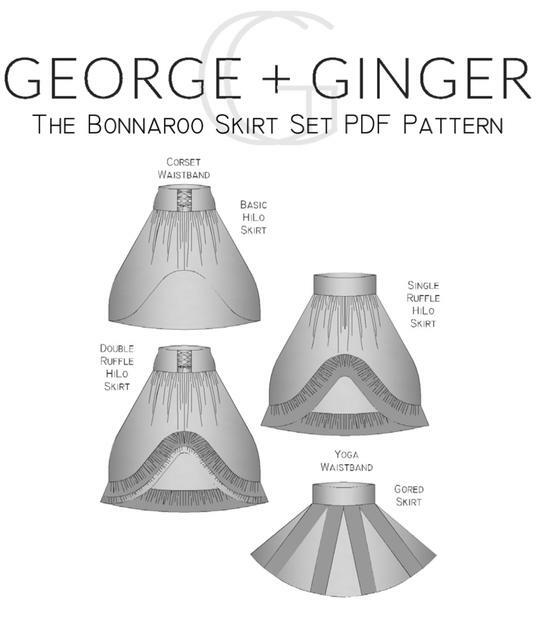 I was able to test the first pattern bundle in the collection - The Bonnaroo Bundle - which includes 2 different skirts (gored and hi-low) with 2 interchangeable waistbands (corset and yoga foldover) and a tank with cropped and top lengths. With the variety of options, almost everyone should be able to find something that suits their needs. I made the gored skirt with foldover yoga waistband and the tank in top length. I ordered several rayon challis prints when I knew this pattern was coming up for testing and while I never intended to use these 2 prints together, I love how they compliment one another. Both were purchased from Fabric.com. The gored skirt has quite a bit of volume, but feels so light and floaty because it's sewn from rayon challis. Top-stitching your seams is optional, but I like how it keeps everything nice and flat. It can be tricky to cut and sew slippery fabric like this, but it was worth it for the finished skirt. For the tank and foldover yoga band, I used my favorite bamboo lycra from Mood Fabrics in white. Seriously folks, their bamboo knit is amazing - nice and thick, washes well and feels amazing to wear. It was a great choice for this tank and the waistband. 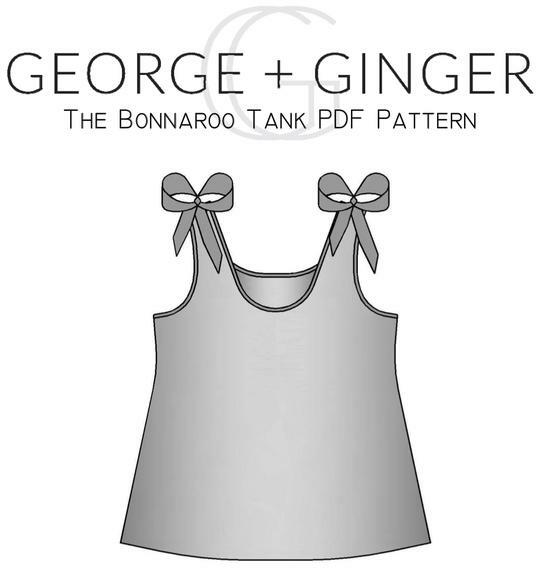 The tank pattern comes with faux ties at the top of the shoulders that add a sweet touch, but can easily be left off if they aren't your style. The body of the tank is fitted through the bust and relaxed through the waist and hips. I think this set will be perfect for those hot So Cal days when I want to look cute, but stay cool. And while boho chic isn't necessarily my go-to style, these pieces feel good on and something I will be happy to sport throughout the summer. Sometimes it's good to shake things up and try new styles! I did not test the hi-low skirt or the corset waistband, but the other testers made some beautiful versions and I already have a lovely kelly green gauze picked out for the hi-low skirt and a vision for styling. Stay tuned! For the last decade, J.Crew has been my go-to shop for swimsuits. I liked their styles, their prints, how they fit and how well they held up over the years. Unfortunately, I've been pretty disappointed in their offerings the past couple of years. And while I looked at other designers, I've never found anything that I've liked as much as my J.Crew suits, even with though I'm not thrilled with them either these days. When I signed up to do the RTW Fast for 2018, the thing that made me the most nervous was "what am I supposed to do about a new swimsuit for our summer trips?!" The idea of sewing a swimsuit was terrifying. I've always said I would never sew swimwear because it's not just a cute piece of clothing it needs to do a very specific job and it needs to do it well! On top of that, everyone will tell you how HARD it is to sew a swimsuit. The fabric is slippery! Getting the right fit is tricky! Sewing elastic is scary! I mean, the whole thing sounded frustrating at best, but if I wanted a new bikini for our Hawaii trip this year, I was going to have to make one to stay true to the rules of the Fast. 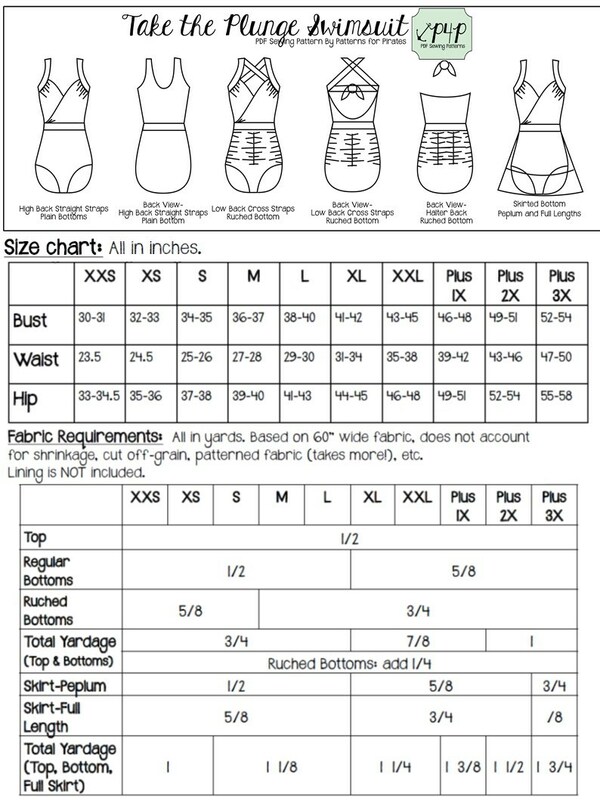 For my very first foray into sewing swimwear, I opted to try the P4P Take the Plunge suit (afflink). This is actually a one piece suit with a ruched front bodice and then a variety of mix and match back and bottom options. 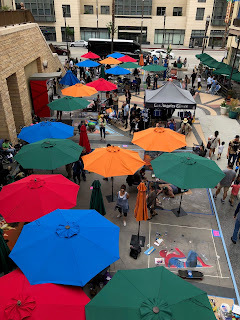 I, myself, am a bikini girl, so I set out to make the bikini hack option, that is outlined on the P4P Take the Plunge hacks blog post. My final selections for my suit were the low cross-back top with a side-ruched bottom. I opted for a deep kelly green swim knit from Joann's for my main fabric and a black lining fabric from The Fabric Fairy. I also used cotton swimwear elastic from Joann's, since I knew that it would be easier to stretch it for the ruching on the sides of the bottoms and a 3/4" clear plastic bikini top closure. This swimsuit is fully lined with no exposed seams and all of the edges are finished with swim elastic and then topstitched. There is an entire page included that gives instructions on how to add additional support to both the top and bottom. I only chose to add bra cups, but they do include options for adding power mesh for the cups and across the tummy as well as under bust elastic for the cups. And this is where I was surprised. You see, I've been sewing with knit fabrics - some well behaved, but plenty that were slippery messes - for years now and I'm very comfortable with them. I'm comfortable with serging on elastic and then topstitching it down. I know how to ease fabrics together along a curve. I know how to gather knit fabric and then sew it to a non-ruched piece. When I finally started sewing this bikini together - the one that had terrified me for a very long time - I was already comfortable with all of the techniques needed to complete a suit that looks like it is ready to wear. Was it tedious? ABSOLUTELY! Having to baste everything and then attaching elastic to almost everything is time consuming and can't really be rushed. Sewing this suit was a ton of little steps that added up to a big chunk of time. But was it hard? No, not really. The sewing steps were pretty straightforward and things that I had already done several times over with other projects, just not on a swimsuit. So, while I was pleasantly surprised with the sewing and the aesthetics of the project, we all know that unless it fits and looks good on a person, it doesn't really matter how it looks laying on the sewing table. 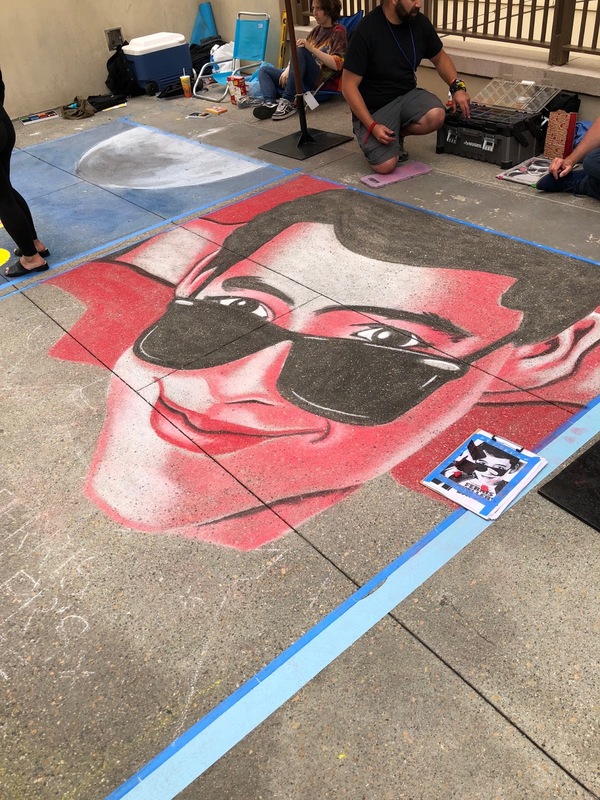 didn't hate it. In fact, I liked it. A LOT. YOU GUYS, MY FIRST SWIMSUIT THAT I EVER SEWED WAS A COMPLETE SUCCESS!!! It's been a few days and I'm still in shock. It fits me like a glove. It's comfortable. I love it's sort of retro vibe that also feels fresh and modern for 2018. I can run after my kids in the top and feel completely secure, but I am also excited to lounge poolside with my husband in Vegas and feel chic and sophisticated. If you are looking for swimsuit pattern, I cannot recommend this one enough. It is such a well drafted swimsuit and one that is flattering on many different shapes and sizes (check out the tester pics on the pattern itself - such a lovely bunch beautiful women!) I have at least one more of this exact suit planned and may even try out the other bikini top option they cover in the hacks blog post. I'm so glad that the RTW Fast finally gave me the additional motivation to just get over myself and sew a swimsuit already! I had no idea the first one would go so well and now I feel confident in going forward and sewing additional suits in fun prints and different styles. Having the freedom to sew what I want to wear to the pool instead of being tied to whatever I can find in store is a huge accomplishment and something that I will be glowing over for some time to come. 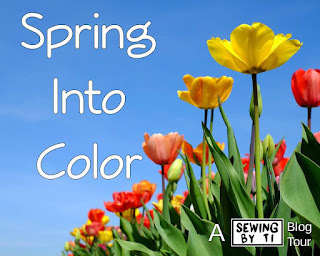 While we've had an extremely mild winter here in Southern California, especially compared to the rest of the country, I'm still excited for Spring fashions and to move into a brighter color palette! 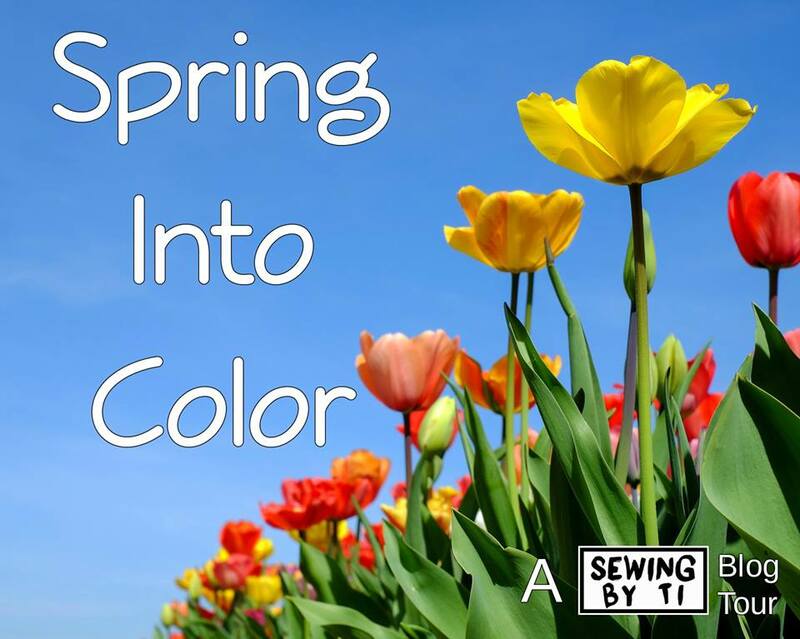 So, let's kick it off with a Sewing by Ti Blog Tour with the appropriate theme of "Spring into Color." 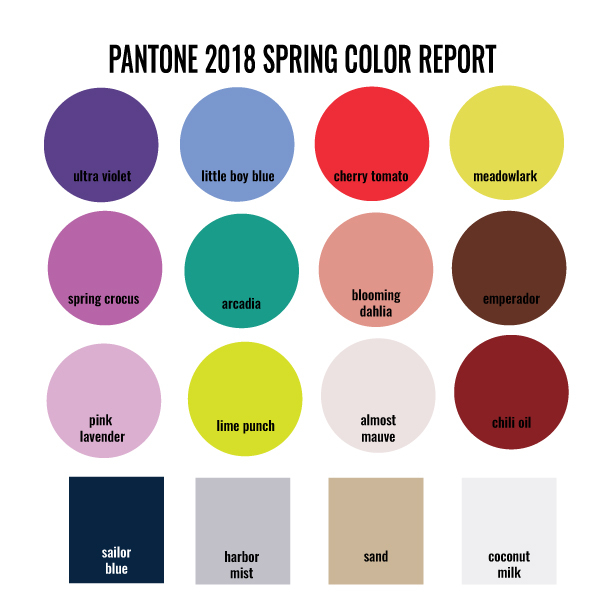 The Pantone color palette for Spring 2018 includes lots of beautiful bright colors and a few neutrals to anchor it all. I find that I always wish I had more short spring and summer dresses in my closet as I like wearing them to meetings and events when the weather is warm. Something that is appropriate for a lunch date or a meeting at church tends to get worn the most, so I kept that in mind as I headed into this challenge. 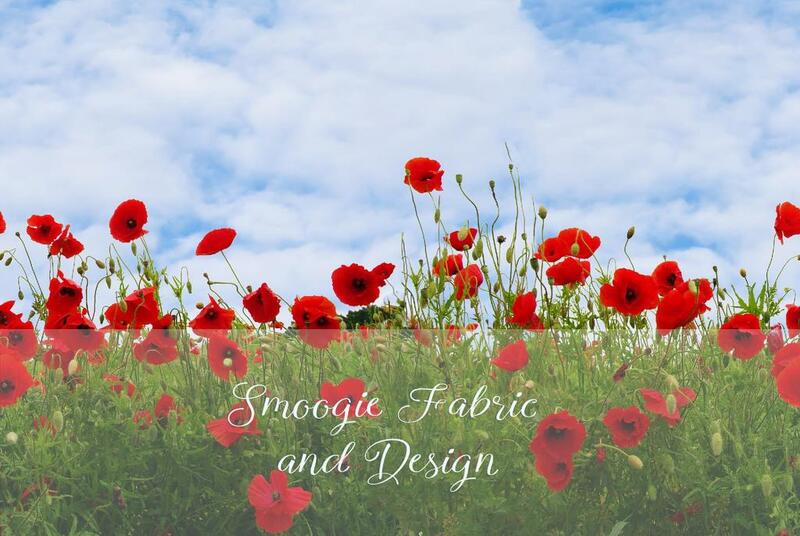 Last fall, I bought a 1 yard brushed poly panel print that featured cherry tomato poppies against a light blue sky and green grass from Smoogie Fabric and Designs. This panel screams SPRING to me so I tucked it away with plans to make a dress in 2018. You can find cherry tomato and hints of little boy blue in the print, so this blog tour was definitely the right time to pull it out and sew it up! I have made a couple of skirts using the P4P Sunshine Dress (afflink) pattern hack in the past few months and have been pleased with them. Pockets can be tricky on me because I carry my weight in my hips and thighs, but these pockets sit flat on the front of the hip and then the front and back of the skirt is gathered around it. It's not only a cute design, but also quite flattering. I wanted to finally make a dress with this skirt, but was looking for something a bit more basic for the bodice than the options that come with the pattern itself. I've used the P4P Layer Me Up (afflink)shirt as a dress bodice in the past with great results and opted to pair it with the Sunshine skirt to make a LMU/Sunshine Dress mash-up! I found a cherry tomato red organic cotton spandex jersey at Mood Fabrics LA and used that for a solid bodice to pair with the panel print skirt. This skirt is A LOT of print, but I love how the solid red on the bodice anchors it and keeps it chic. I hemmed the skirt so that it was above the knee, which tends to be a good length on me. I also made sure to have a sleeveless bodice so that I can either wear it solo or with a cardigan layered over it depending on the weather. Spring weather in LA is a mish mosh and I like having the versatility of different shoe and topper options so this dress would be appropriate across a range of temps. And did I mention this dress has *pockets*?!? I mean, who doesn't love a dress with pockets! Anybody else love outerwear? Living in Southern California, my need for true coats and heavy sweaters is limited, but I can always use a light- to mid-weight jacket for layering when it is chilly in the mornings or evenings. The P4P Go To Jacket (afflink)is a staple casual jacket that includes a bomber style as well as a 3-piece hoodie option. Choose from shirt or tunic lengths; inseam or kangaroo pockets; hemmed, cuffed or cuffed with thumb hole sleeves; an optional drawstring and lining for the hood and a zipper guard piece that helps protect your chin from the top of your zipper. I used a graphic floral quilted poly knit fabric from So Sew English with black ABP accents from Zenith and Quasar for my first tester version - a shirt length, lined hoodie jacket with kangaroo pockets and cuffed sleeves. I LOVE the 3 piece hood - it fits on the head really well, but also lays nicely on your upper back when worn down. I did add optional topstitching to help the seams lay flat and give it even more of a ready-to-wear look. The sleeves are relaxed enough to easily layer over a long sleeve top, but not too oversized to look silly if it's only worn over a tank top. Worried about installing the zipper? No need! 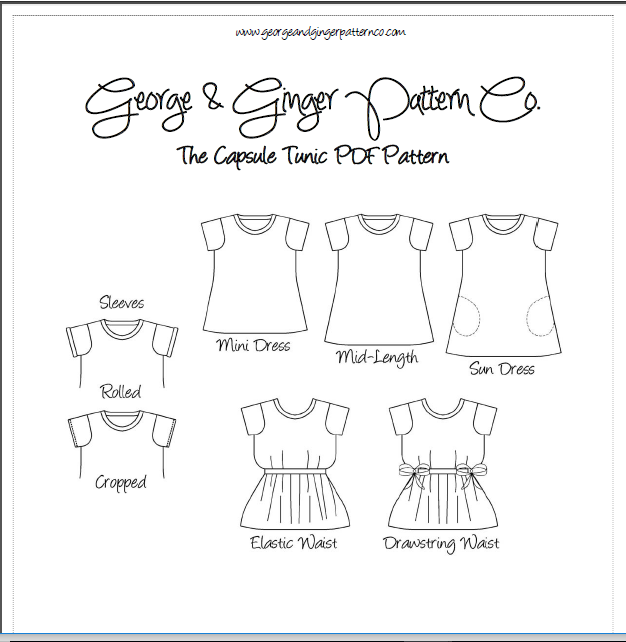 The pattern comes with links to 2 videos: how to shorten a separating zipper and how to install the zipper using the zipper guard piece as well as very detailed instructions in the written tutorial. I've installed several separating zippers before this jacket and I think the method included here is one of the best I've seen. I love this little hoodie so much, that when they were looking for a few more testers for the youth version, I signed up my oldest son. Here he is modeling HIS first tester version - shirt length, lined hood, kangaroo pockets and cuffed sleeves - both fabrics are french terry from Sincerely Rylee Fabrics. Y'all, his faces about killed me in this shoot - my baby is growing up! He loves this jacket and I plan to make several more later this year when both of my boys need fall sweatshirts. For our final versions of these patterns, I knew I wanted to do a Mommy and Me set. I've had some custom cotton lycra fabric from MK Designs in my stash for a year now, just waiting for the right project and this was it! I used the same options as our first versions because I knew they would get the most use from both of us. These lightweight hoodies will be perfect for cool evenings when we visit Disneyland and need a light layer to keep the chill off. The Go To Jacket also includes a Men's version, so you can make jackets for the whole family! Grab the Go To Jacket pattern for Women, Men or Youth OR the complete Bundle (afflinks) starting today - the sale prices are good through 3/8 at 11:59 US Central time zone. thirty-something female married to a wonderful thirty-something man. loves food. loves to dance. loves to read. loves to sew. loves all things pink. screw the turtle, isn't it time i win the race?